Registration is open for the CNPA Capital Conference, to be held Feb. 4-6, 2019, at the Kimpton Sawyer Hotel in Sacramento. 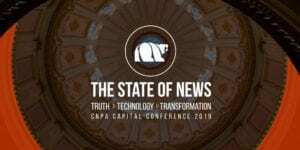 The conference, themed “The State of News: Truth, Technology, Transformation,” combines the annual Governmental Affairs Day and Annual Press Summit into a single event. It will feature discussions and presentations on sustainable business models, reporting on California, and conversations with some of California’s most dynamic leaders. CNPA will also present its first “Free Speech Champion” Award to a member of the Legislature who has been a supporter of the First Amendment rights of the press. Complete details about the Capital Conference are at the conference site. Questions? Renee Smith, 916-288-6017.